Kumar filter press are very popular throughout the country and abroad in view of its quality and workmanship coupled with our long standing experience. This filer press are used in oil mills and also in the chemical industry. 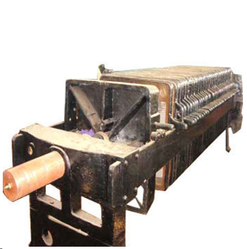 We manufacture quality cast iron filter press and are available with ratchet type tightening. We offer Cast Iron Recessed Filter Press, which are plate type filter press with center feeding mainly used in chemicals and mustard oils. Filter Press Size: 36" x 36"
We are offering our valuable clients an exclusive range of Cast Iron Filter Press, Filter Plate such as Recessed Chamber Filter Press Plates, Round PP Plate, Chamber Filter Plate, Hydraulic Filter Press Plates and Four Corner Plate. Matching with the requirements of the clients, we are offering a wide assortment of Cast Iron Filter Press. The Cast Iron Filter Press we offer is recommended amongst the clients for its precise use. Safe to use and easy to install these products are made by using quality material which is sourced from reliable vendors. 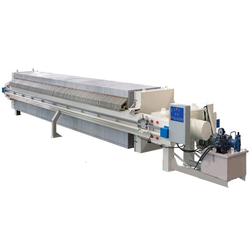 The filter press is a solid liquid separating equipment working on the principle of pressure feeding. It has been used successfully in almost every industrial filter application. It consists of a series of filter plates and frame or recessed plates arranged parallel and fitted on conventional cast or mild steel structures.